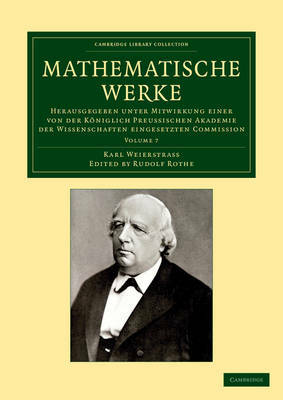 The German mathematician Karl Weierstrass (1815-97) is generally considered to be the father of modern analysis. His clear eye for what was important is demonstrated by the publication, late in life, of his polynomial approximation theorem; suitably generalised as the Stone-Weierstrass theorem, it became a central tool for twentieth-century analysis. Furthermore, the Weierstrass nowhere-differentiable function is the seed from which springs the entire modern theory of mathematical finance. The best students in Europe came to Berlin to attend his lectures, and his rigorous style still dominates the first analysis course at any university. His seven-volume collected works in the original German contain not only published treatises but also records of many of his famous lecture courses. Edited by Rudolf Rothe (1873-1942), Volume 7 was published in 1927.